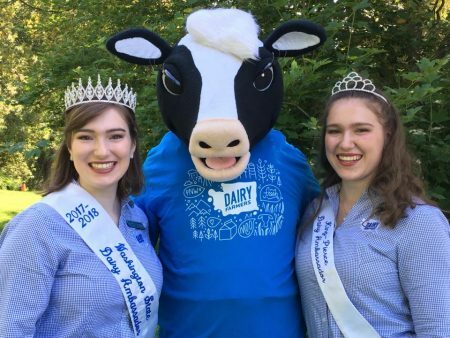 We are saddened to report that Anna Teachman, the 2017 Washington State Dairy Ambassador, was killed in an auto accident along with her father Mike. With the permission of Lori Teachman, Anna’s mother, we have some sad news to share with you. Anna and her father, Mike Teachman, were in a tragic vehicle accident on Sunday night at 7:00 p.m. in Mannford, Oklahoma. The family, Mike, Lori, Anna and Kara had enjoyed a family vacation traveling down through California and up Route 66 to bring Anna to registration and orientation at Oklahoma State University (OSU). At the end of the vacation Lori and Kara were flying home for a Dairy Ambassador workshop, so they were dropped off at the airport, and Mike and Anna continued driving to OSU. About 30 minutes outside of Tulsa Mike and Anna were in a head-on car accident with a truck and trailer which crossed the center line. Mike died at the scene, but Anna was transported to the hospital and has been in ICU since. It has been determined that Anna died also as the result of a traumatic brain injury at the time of the accident. Since she has been kept on life support, Anna will live on with the gift of life to many others through organ donation. We are confident both Mike and Anna, though absent from us here on earth, will live eternally in heaven because of their faith in Jesus Christ as their Savior. All of our community of family and friends send our love and prayers to Lori and Kara. Mike and Anna will always be with us in memory and will never be forgotten. Although we don’t understand the why of this tragedy in our lives, we know that God is in control.